Last month I was invited along to Benidorm on behalf of Ice Lolly holidays and the Benidorm tourism board, to experience the alternative side of the Spanish destination. I have two posts planned, so I'm kicking this one off with a 'Eat, sleep, explore' post, which will give you a brief insight to the highlights of my stay! For our stay in Benidorm, we were fortunate to stay at the lovely Sandos Monaco hotel. 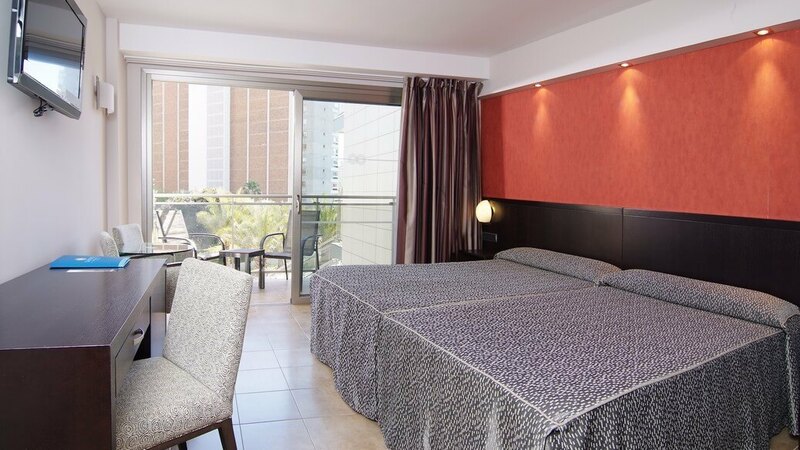 The all inclusive resort is perfectly situated in Benidorm, it's a straight walk close by to the beach, with easy access to restaurants and bars around you, whilst still achieving to be away from the main strip loudness. What I loved about this hotel was the fact it was an adults only resort, which is perfect for people like me who cannot stand the idea of being around children on an all inclusive holiday. 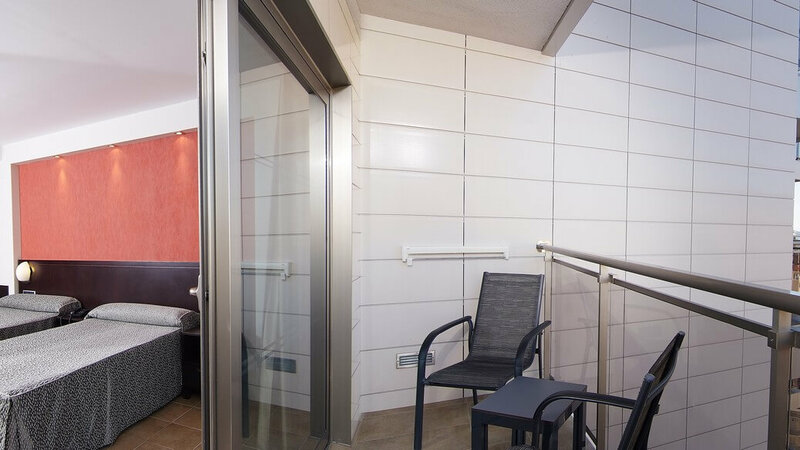 The Sandos Monaco also has a gorgeous little spa on the basement floor which offers a range of treatments for its guests, as well as a small gym, fully equipped with all of your gym needs for those who are looking for that little bit extra. The air conditioned bedrooms were really spacious which was exactly what I wanted but wasn't necessarily expecting. The room had its own private balcony which was equipped with 2 chairs and a table, my view wasn't too great, but still I was thankful to have a view at least! The rooms had large comfortable beds, huge wardrobe with hangers, there's a spacious bathroom with a powerful shower and large bath tub. There were also some other features which made the room fantastic, such as the mini fridge, flat screen TV, self controlled air conditioning & a mini safe box. We ate breakfast here every day during our stay, which was fantastic! the buffet had a great selection of breakfast items, including a separate buffet stand for vegans! the food served on this stand was really great, I had a delicious vegetarian fry up each morning. We only experienced one lunch time here, which was really tasty too. Again the vegan corner was full of fantastic dishes, my favourite had to be the aubergine dish they were serving one day. I'm not able to comment on the dinner buffet since we didn't experience one during our stay, though going by how good the breakfast and lunch was, I can imagine the dinner had a great selection too! Seeing as this is an all inclusive resort, all of your drinks are included throughout the day at the pool bar, and the snack bar. I loved the sangrias! I heard they do food at the snack bar too, but didn't experience this for myself. Overall I loved my stay here, I thought it was a great place for people who want more of a relaxing holiday here in Benidorm. Ice Lolly offer holidays to stay here in Benidorm which you can find here. this cosy little street is packed with incredible little tapas restaurants on top of each other. There's so many too choose from, I would personally hop around and see what takes your fancy, why not try a few different places? That's the beauty of tapas, you can have a mixture of small dishes! We ate at Le Taperia, it was delicious! My favourite had to be the potato bravas, and the shallow fried aubergine slices. The only problem I had that there wasn't that many vegetarian dishes, but, dessert sure did make up for it! All 7 of us shared a couple of dessert platters which consisted of decadent brownies, mouth watering cheese cakes and many more! Paella has my heart. When in Spain, Paella is all I want to eat. One day for lunch we headed to Ulia, for an incredible lunch right beside the beach. Me and Amanda were the only vegetarians, so we had an absolutely HEAPED plate full of goodness. The flavours were unbelievable. It was one of the tastiest paellas I've ever had! There's so much more to Benidorm than the crazy English strip. In fact, I'd say avoid that completely if you're looking to experience the real Benidorm. I absolutely loved exploring Benidorm during our time there. I'll be talking about a few other things to do in a separate post, but here are my two favourite experiences from the trip. On one of the days we spent an hour snorkelling in Benidorm. We headed down to the marina where we were kitted out in wet suits to head into the water with. The water was still pretty cold in May, but really refreshing regardless. We hopped on a speed boat and were driven to the island in eyes sight of Benidorm's shore. It was a gorgeous little spot, the water was incredibly clear, and was known for being the best snorkel spot in Benidorm. I never usually enjoy snorkelling, but this time round I absolutely loved it. If you're heading to Benidorm and want to experience something different for a few hours, definitely head out with your snorkel! On our first day in Benidorm we rented eco friendly electric bikes from TAOBIKES. I hadn't ridden a pedal bike in YEARS, let alone an electric one... so it's safe to say I was a little nervous. Well, it was actually incredibly fun! most definitely the high light of the whole trip for me and most of the other girls. We drove up to the national park, which is a hilly ride away from the city center but offers incredible views throughout the ride. 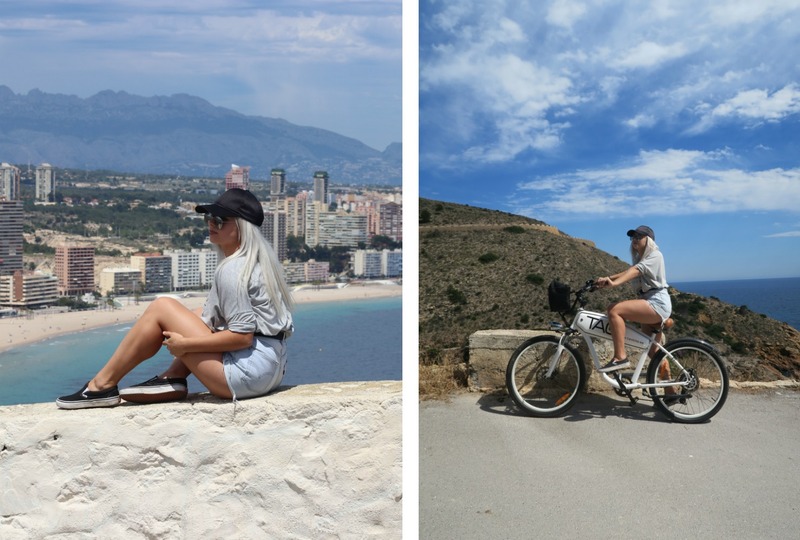 You can rent an electric bike from TAO bikes for as little as €18, this is a truly incredible way to see some beautiful spots in Benidorm. Stay tuned for my second post talking about other alternative things to do whilst in Benidorm! This looks like an amazing place - it really makes me want to take a vacation. I really want to go to Benidorm but didn't know what was the best thing to do there other than the strip or lie on the beach! Definitely can't wait for your next post as I'm intrigued! I'm so glad for you! I have a desire to learn how to ride a bicycle. According to different questionnaires this kind of sport is very dynamic and passionate. This is my dream for a long time. My sport school will help me to start and also they will write an essay for me . It's great that people run such blogs. I am happy to read them.